Then 'appropriate for the occasion' wall décor treatments can be an important visual contributor in creating these impressions whether for a board room, reception, meeting rooms or private offices. If time is your enemy , and art is not one of your areas of expertise, then delegate the decorating challenge to one of our art consultants. He can, at no charge and no obligation, research the images, put together a plan, order the product and install it when it arrives - all subject to your approval, of course! 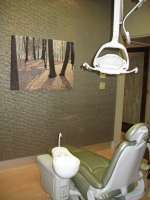 Naturally you will want to achieve a professional look that is compatible with your office furnishings and colours. Certainly you will want good value - quality décor that looks more expensive than it is. And, good value also means advantageous pricing that puts a smile on your CFO's face. At ManorHill Fine Art we listen to what you say. We ask questions about what visual effect you wish to achieve. Then we go to work to find and recommend images that fit with both your décor wishes and budget. And don't worry... 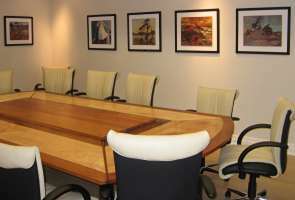 If you are not sure what kind of art would work in your office, we can most certainly make suggestions. Bright, bold colours, or understated muted tones... landscapes or abstracts... photography or originals... canvas, texturized or under glass. Let us help you figure it out. You will be impressed with the quality of the product and the personalized service that we provide. 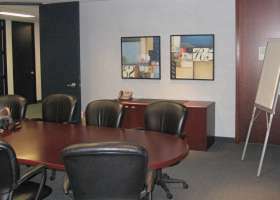 Please see photos of the office decor of some of our corporate clients below. Framed pieces of art from the ManorHill collection make treasured employee awards and lasting corporate gifts. ManorHill Fine Art is proud to offer distinctly Canadian art featuring a stunning collection from Tom Thomson and the Group of Seven artists. These include beautifully framed Limited Editions and decorator prints by such acclaimed artists as Tom Thomson, A.Y. Jackson, Lawren Harris and Franklin Carmichael. There are a wide range of framing treatments and price points. As well as the classic and very Canadian Group of Seven images, ManorHill Fine Art also carries a wonderful array of prints by contemporary Canadian artists. We can help take the guesswork out of decision-making, and are happy to offer suggestions according to the occasion or the individual. All Limited Edition prints are published on a heavyweight stock and with the highest standards of quality printing. All have enhancing framing treatments in a variety of contemporary mouldings with double mats which are acid-free and of museum quality. Each piece of art comes in a customized box suitable for wrapping. Personalized brass plaques can be attached to the art, if desired. Call us to explain your occasion or your requirements and let us make some suggestions. There is no obligation and no minimum order. 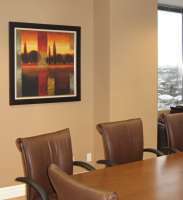 We can visit your office with selected samples of the artwork. Presentations with framed prints can be arranged where circumstances dictate.